Glow Dust can be found on dead wisps and wispmothers, along with wisp wrappings. Glow dust can be looted from the remaining ash piles of dead wispmothers, including the named wispmother the Pale Lady. 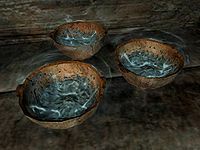 The wisp cores left behind after killing the spawned wisps also contain one to three glow dust each. Glow dust is frequently confused with ectoplasm, which comes from ghosts and has completely different alchemical properties. This page was last modified on 3 June 2018, at 17:51.